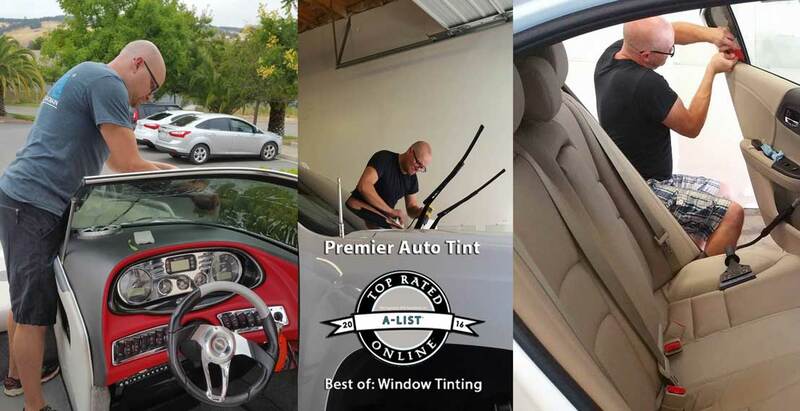 Premier Auto Tint has received a Third Consecutive Sacramento A-List Award recognized with the “2018 Best Window Tinting Service Award” climbing the Awards List to another Top-10 Ranking in local Sacramento Metropolitan Area Services in the competition. Premier Auto Tint, an El Dorado Hills, Ca. full-service Automobile Tinting Film Installer has been recognized by the Sacramento A-List “2018 Best Window Tinting” Awards Program taking home Top-10 Honors placing #9 of the 23 services in the competition. Sacramento A-List presented the award to Premier Auto Tint on their website’s Listing of Award Winners under the Best Window Tinting Category in the Sacramento Metropolitan Area. This is a consecutive award within the same Window Tinting Services Category. Potential award recipients were required to be nominated by regional Auto Window Tinting Customers in order to be in contention for the Sacramento A-List Awards. Each service competitor was judged through the more than 84,000 overwhelmingly positive customer review votes, by the 2018 Sacramento A-List Awards Committee and by local Sacramento-Area Experts within their specific service category. The final award selections were set through committee based on the expert reviews and the voting customer reviews supporting comments. Nick Williams, Owner of Premier Auto Tint was very pleased about the company’s performance saying, “Premier Auto Tint provides Consistent Quality in the Auto Window Tinting Services we offer and three consecutive Best of Window Tinting Awards for the Sacramento Metro Area is no easy feat. We have always taken pride in the services we provide and the expert workmanship shows through to every customer. We are professional installers and always try to exceed the expectations. Premier Auto Tint is a full Vehicle Film Installation Services Company providing XPEL ULTIMATE Paint Protection “Clear Bra” Film and Custom Car Wraps (Auto Paint Alternatives and Custom Designed Advertising Graphics) installations services, in addition to the Solar Gard® Ultra Performance Automobile Window Film Services; subject of the 2018 Best of Sacramento’s Window Tinting Services Award from Sacramento A-List’s Awards Program. Persons interested in learning more about Premier Auto Tint and the award can visit the website at https://www.PremierAutoTint.com/. 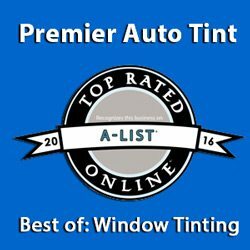 Premier Auto Tint has received their third consecutive Sacramento A-List Award Nomination for being recognized as one of the highest praised and recommended local Sacramento Metropolitan Area Automotive Window Tinting Services once again in the competition to see who customers select as the Best of the Best in 2018. 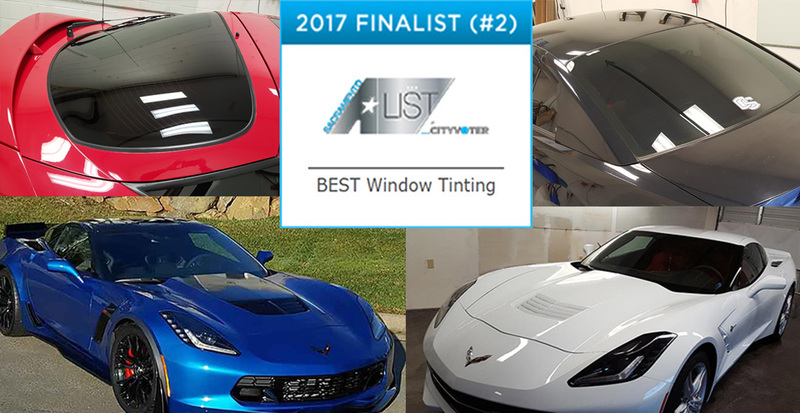 The Sacramento A-List Awards selection program placed Premier Auto Tint as the #2, 1st runner-up in their 2017 Best of Auto Window Tinting Category on top of the 23 other Window Tinging Services in the competition. The Sacramento A-List Awards Program presents these annual awards to the recipients on display in their website’s Listing of Award Winners under the Auto – Best Window Tinting Sacramento – Category for California’s Greater Sacramento Valley and the Local Sacramento Metropolitan Area. Potential award recipients are required to be nominated by regional Auto Window Tinting Customers in order to be in contention for the Sacramento A-List Awards. Each service competitor was judged by the more than 84,000 overwhelmingly positive customer review votes, by the 2018 Sacramento A-List Awards Committee and by local Sacramento Area Experts within their specific service category. The final award selections were set by the committee based on the expert reviews and the voting customer reviews supporting comments. Voting for Nominees ends Apr 29th and the Winners will be announced on May, 21st 2018. Nick Williams, Owner of Premier Auto Tint was very pleased about the recognition of his company’s continued high-level of service performance and overall Customer Satisfaction saying, “Premier Auto Tint has and will always take pride in the services we provide. Our expert workmanship in the Automotive Protective Film Industry is unmatched. When you compete Head-to-Head against the Best-of-the-Best of International Auto Film Installers, and place #6 in the Las Vegas International Tint-Off Competition, it is a clear indicator of the quality services we provide each of our customers. Everyone should want, expect and get the best services for their car and that is why you should bring your vehicle to Premier Auto Tint. 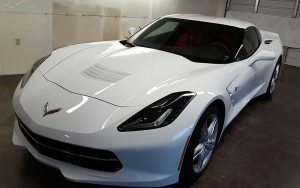 Premier Auto Tint is a full Vehicle Film Installation Services Company providing XPEL ULTIMATE Paint Protection “Clear Bra” Film and Custom Car Wraps (Auto Paint Alternatives and Custom Designed Advertising Graphic Wrap) installations services, in addition to the Solar Gard® UltraPerformance Automobile Window Film Services; subject of the 2018 Best of Sacramento’s Window Tinting Services Award from the Sacramento A-List Awards Program. 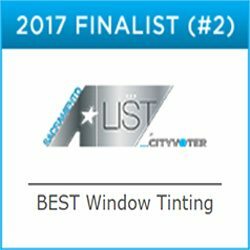 Premier Auto Tint is nominated for the 2018 Best Window Tinting Services Award by the Sacramento A-List Award Program. 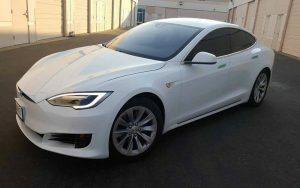 Premier Auto Tint is a Vehicle Film Installation Services Company in El Dorado Hills, CA. More information is available on their website at https://www.PremierAutoTint.com/. 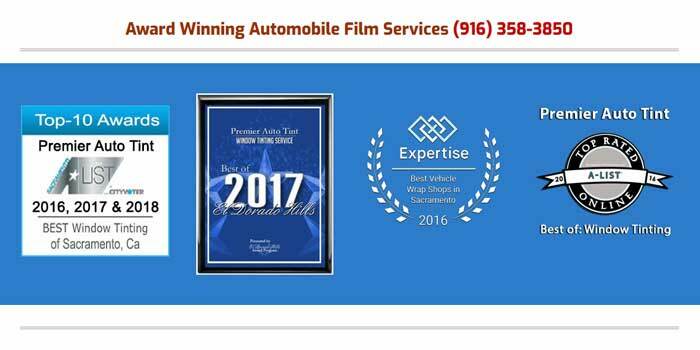 Premier Auto Tint has received a consecutive Sacramento A-List Award recognized with the “2017 Best Window Tinting” Service Award climbing the Awards List from a 2016 Top-10 Ranking in 2016 to placing #2 of the 23 local Sacramento Metropolitan Area Services in the competition. Premier Auto Tint, an El Dorado Hills, Ca. 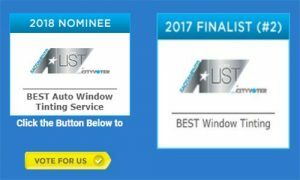 full service Automobile Protective Film Installer has been recognized by the Sacramento A-List “2017 Best Window Tinting” Awards program taking home Top-5 Honors placing #2 of the 23 services in the competition. Sacramento A-List presented the award to Premier Auto Tint on their website’s Listing of Award Winners under the Best Window Tinting Category in the Sacramento Metropolitan Area. This is a consecutive award within the same Window Tinting Services Category. Potential award recipients were required to be nominated by regional Auto Window Tinting Customers in order to be in contention for the Sacramento A-List Awards. Each service competitor was judged through the more than 84,000 overwhelmingly positive customer review votes,​ by the 2017 Sacramento A-List Awards Committee​ and by local Sacramento-Area Experts within their specific service category. The final award selections were set through committee based on the expert reviews and the voting customer reviews supporting comments. e expert workmanship we provide for every customer. We are professional installers and always try to exceed the expectations of our clients by continually raising the bar in all that we do. Last year, we placed in the Top-10 for this award, having newly opened our auto protective film installation facility in El Dorado Hills, California. 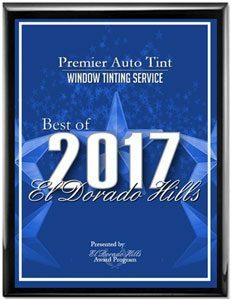 Now, a year later, being awarded and ranked #2 of the 23 other competitors in the Best Auto Window Tinting Services Category in the Sacramento Metropolitan Area is a truly great place to be in 2017! We are still establishing our business and its growing high quality services reputation, yet nothing says quality like a consecutive ​award for “quality of services” through the evaluation of experts and customer reviews. Premier Auto Tint is a full Vehicle Film Installation Services Company providing XPEL ULTIMATE Paint Protection “Clear Bra” Film and Custom Car Wraps (Auto Paint Alternatives and Custom Designed Advertising Graphics) installations services, in addition to the Solar Gard® Ultra Performance Automobile Window Film Services; subject of the 2017 Best of Sacramento’s Window Tinting Services Award from Sacramento A-List’s Awards Program. 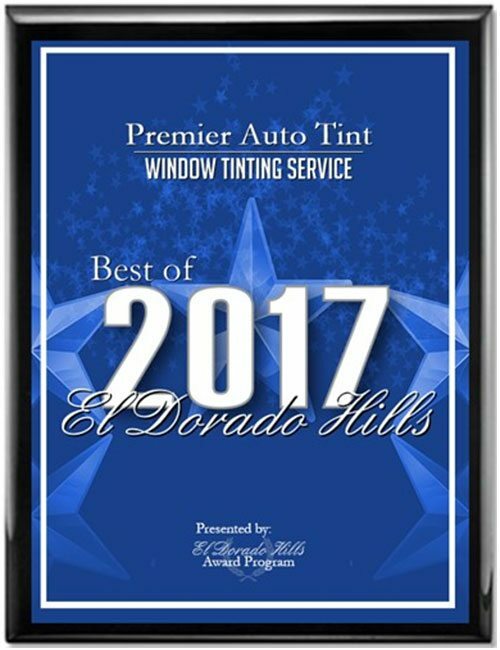 EL DORADO HILLS – July 5, 2017 — Premier Auto Tint has been selected for the 2017 Best of El Dorado Hills Award in the Window Tinting Service category by the El Dorado Hills Award Program. Each year, the El Dorado Hills Award Program identifies companies that we believe have achieved exceptional marketing success in their local community and business category. These are local companies that enhance the positive image of small business through service to their customers and our community. These exceptional companies help make the El Dorado Hills area a great place to live, work and play. Various sources of information were gathered and analyzed to choose the winners in each category. The 2017 El Dorado Hills Award Program focuses on quality, not quantity. 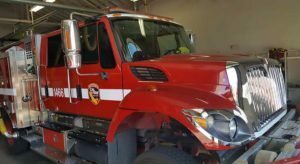 Winners are determined based on the information gathered both internally by the El Dorado Hills Award Program and data provided by third parties. The El Dorado Hills Award Program is an annual awards program honoring the achievements and accomplishments of local businesses throughout the El Dorado Hills area. Recognition is given to those companies that have shown the ability to use their best practices and implemented programs to generate competitive advantages and long-term value. The El Dorado Hills Award Program was established to recognize the best of local businesses in our community. Our organization works exclusively with local business owners, trade groups, professional associations and other business advertising and marketing groups. Our mission is to recognize the small business community’s contributions to the U.S. economy. Premier Auto Tint is a full Vehicle Protective Film Installation Services Company providing XPEL ULTIMATE Paint Protection “Clear Bra” Film and Custom Car Wraps (Auto Paint Alternatives and Custom Designed Advertising Graphics) installations services in addition to the Solar Gard® Ultra Performance Automobile Window Film services subject of the 2017 Best of El Dorado Hills Window Tinting Services Award. Persons interested in learning more about Premier Auto Tint and the Award Winning Installer Services we provide can visit the website at https://premierautotint.com/services/. 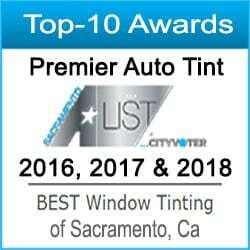 Premier Auto Tint was named a winner of the Sacramento A-List “2016 Best Window Tinting” Awards competing against 19 other Sacramento Window Tinting Services to take home Top-10 Honors. Sacramento A-List presented the award to Premier Auto Tint in their Online Listing of Award Winners. Details about the award can be found on the Sacramento A-List website at http://sacramento.cityvoter.com/premier-auto-tint/biz/707589. Premier Auto Tint is a full Vehicle Film Services Company providing XPEL ULTIMATE Paint Protection “Clear Bra” Film and Custom Car Wraps (Auto Paint Alternatives and Custom Designed Advertising Graphics) installations services, besides the Solar Gard® Ultra Performance Auto Window Film services subject of the Best of Sacramento Window Tinting Services Award. Persons interested in learning more about Premier Auto Tint and the award can visit the website at http://PremierAutoTint.com/.